Essentially, all the furniture in your house is "cat furniture." If that's OK with you, then there's no problem. However, if you prefer that your feline friend uses "special" furniture, just for him or her, then you may have to take a few steps to encourage your kitty to use the "cat stuff" and stop using yours! Choosing the right items for your kitty can help him know what's "his" and what's "yours." What Does Your Cat Really Need? Cats don't really need much in the way of special furniture, but they do have some needs that can best be met by items designed especially for cats. Pet stores know how much we love our pets and they provide more than any of us (or our cats) really need. You really have to be careful not to go overboard (unless you want to!). Most all of your cat's needs can be met inexpensively, especially if you are creative and/or handy. a cat tree or "kitty condo." Cats need to scratch to keep their nails healthy and to get exercise, so a good scratching post is an essential item for any cat home. 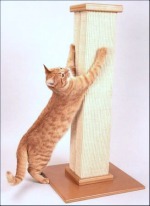 Sisal cat scratching posts are popular with cats. It gives them something to sink their claws into, and is preferred by most cats over soft carpeting. Be sure to get a post that is sturdy and tall enough for your cat's fully stretched body. Cats need a clean, quiet, and private place to sleep. Online and in the cat furniture section of most pet supply stores, you can find special, padded cat beds of various styles and colors. You should be able to find a comfortable one to match the décor of your home and your cat's preference. If you don't want to buy a special bed for your cat, you can always make one yourself by using something like a soft, clean, folded towel or small blanket strategically placed in your kitty's favorite sleeping place or places. Another great idea is a combo cat carrier-cat bed that provides a great place to sleep, PLUS makes trips to the veterinarian so much easier. However, if your kitty absolutely hates trips to the vet, then he or she could associate this combo only with unpleasant things and not use the bed. So only choose this one if your cat likes, or at least doesn't mind, taking trips. The two things cats love to do more than anything are be in high places and look out of windows! A cat perch is the one item that can provide your cat with the comfort and pleasure she deserves. Some cat perches are "window perches" and are designed to attach to a window inside your home. They are usually quite easy to install. This popular item for cats has the benefit of giving your cat some elevation and entertainment at the same time! Cat trees and kitty condos come in all different shapes and sizes, and can serve many purposes. They are usually carpeted and provided your cat with at least a couple of shelves, and a post for scratching. Some have little cat houses (carpeted "boxes") with holes for your cat to hang out in. A kitty condo or a cat tree is a great item (although a little expensive unless you build your own cat tree) and can serve as your cat's bed and scratching post all in one. And it provides the high elevation cat loves. The higher the better! Didn't find what you're looking for? Use this Search Box to find more feline information. Or visit the related topics below. 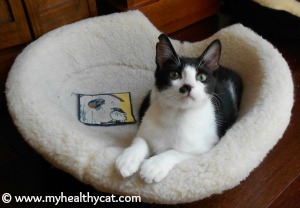 * Cat Beds What to look for when choosing the perfect bed. * Cat Scratching Posts Why felines scratch and more specifics about choosing a good cat scratching post. 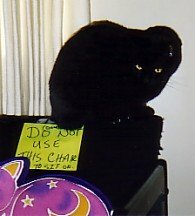 * Green Duck Cat Furniture Read this article to learn characteristics of good cat furniture. CatsPlay has an extensive selection of really unique cat furniture including kitty condos, cat trees, scratching posts, and cat beds. This is their specialty and they have many, many items to choose from. You have to check out the unique stuff they have! PETsMART Cat Furniture offers an excellent selection of all types of pet products at competitive prices. They have cat scratching posts, cat beds, window perches, and cat trees. The site loads a little slowly, but is well worth it for their extensive selection and shipping deals.